Official artwork of Timmy & Tommy from Animal Crossing: New Leaf. 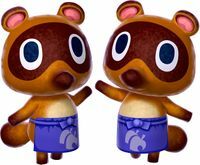 Timmy & Tommy (まめきち&つぶきち, Mamekichi & Tsubukichi), also known as the Nooklings, are twin shopkeepers from the Animal Crossing series, playing a similar role as Tom Nook. In the early Animal Crossing games, Timmy and Tommy Nook were Tom Nook's nephews, who assist him in running Nookington's, the largest upgrade to his store. However, starting in New Leaf, they completely take over the shop while their uncle runs a real estate agency. Their role in Villager's Final Smash likely references them being Tom Nook's assistants in the first three games. Timmy and Tommy appear as a single trophy. Timmy & Tommy trophy in Brawl. Timmy & Tommy return as a trophy in both versions of SSB4 unlocked when clearing Trophy Run. They also serve multiple other roles, serving as a blue Tour item in Smash Tour which change nearby items into other, random items. They also appear as elements of Villager's Final Smash, Dream Home, assisting in the construction of the house. Timmy & Tommy's trophy in Super Smash Bros. for Wii U.
Timmy & Tommy's trophy in Super Smash Bros. for Nintendo 3DS. These twin brothers operate the Nookling stores. Thanks to Tom Nook's teachings, they are just as talented as he is and run Nookling Junction with such success that it can expand several times. Despite their success, they never forget the core value of good customer service. Timmy & Tommy return as part of Villager's Final Smash, Dream Home, but also as part of Isabelle's Final Smash, Dream Town Hall. The twins also appear as a Master Spirit. They run one of the shops in Adventure Mode: World of Light. This page was last edited on March 22, 2019, at 00:24.